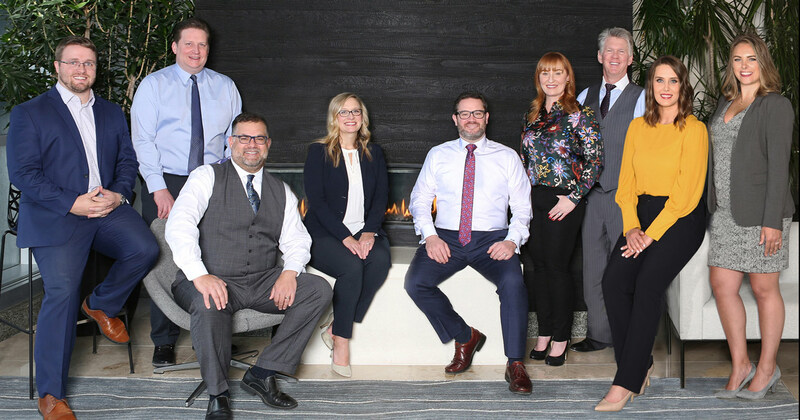 The 10 attorneys at Halberg Criminal Defense bring an unparalleled blend of criminal defense experience together in one law firm - with over 155 years of combined criminal trial experience. Halberg Criminal Defense annually receives numerous awards and individual recognition for our ethical and vigorous defense of people accused of criminal activity. Our firm is recognized within the legal community for excellence in our legal services. 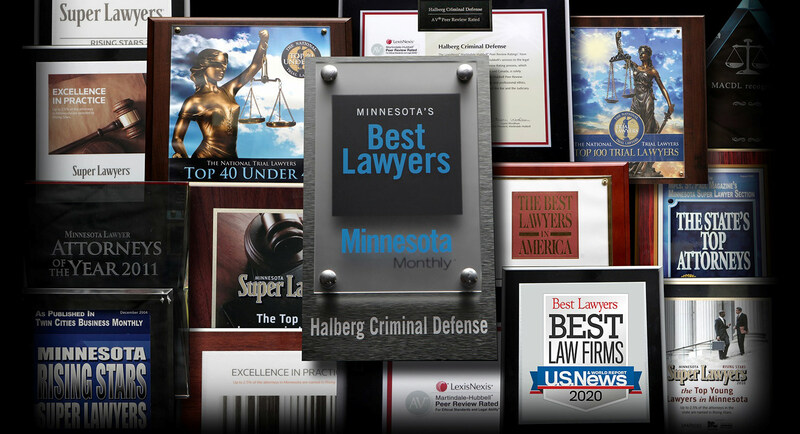 In addition to handling many of the "high-profile" cases in Minnesota, we pride ourselves in the discreet legal assistance we can provide to all Minnesota citizens experiencing criminal difficulties. Individually, each lawyer has earned numerous awards. Proudly, Halberg Criminal Defense has earned Martindale Hubbell's highest "AV Preeminent" rating. 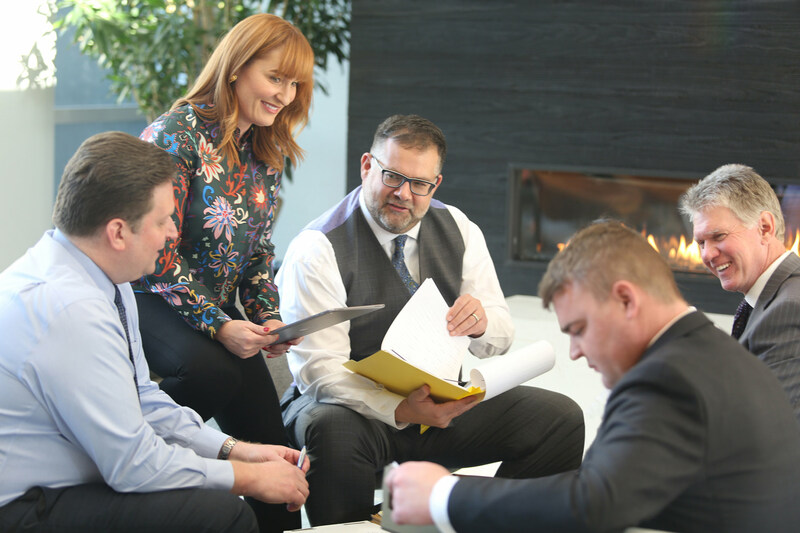 This ranking is a significant rating accomplishment - a testament to the fact that the firm’s peers rank it at the highest level of professional excellence. This award is based upon legal knowledge, analytical capability, judgment, communication ability, and legal experience. Christina Zauhar's client was charged with five separate charges involving domestic assault, disorderly conduct, and gross misdemeanor alcohol-related driving violations. The client was facing serious consequences to his freedom, employment, future ability to carry a firearm, and forfeiture of his vehicle. Through vigorous negotiation and arguing weaknesses in the case, all charges were dismissed against the client except for one driving charge. As a result, there was no forfeiture of the vehicle, no restriction on the use of a firearm, no fine, and no jail time. First Degree Criminal Sexual Conduct Charges Dismissed: Appleby's Persistence Pays Off. Tina, there are Angels all over this world. I may not be able to see them, but know their wings spread and protect, guide, and help whenever I am down. You are like the Angels that I cannot see. A voice a moment away, with words that helped to protect, guide, and help me and my family. Like all Angels that help, they long to spread their wings and find those who need to be helped in the world with what they are guided to do with a good heart and good intentions. You have come into our lives like an Angel for a moment in our lives. Should I never get to meet or see you, I pray that all in your life is blessed. I pray that an Angel guides you, helps you, and protects you in all you do, and return to you what you have done for me and my family. Thank you Tina. From what I hear, it would have been a pleasure to see you in action in court, however, in this case, I am glad it is reserved for another soul who needs you. Drugs and a stolen gun were found when officers executed a search warrant on the home of Tina Appleby's client. He was thereupon charged with Controlled Substance Crime and Receiving Stolen Property--- Firearm. Each are felony crimes that carry stiff sentences. Prior to an evidentiary hearing, Tina convinced the State that it would not be able to prove the drug charge, so the prosecutor dismissed it. Tina then challenged the search warrant as it pertained to the stolen gun, arguing that the officers exceeded their authority. The judge agreed, so that charge was dismissed as well. Tina Appleby had a client charged with two separate Controlled Substance Crime in the First Degree crimes. Each was on a different date, and each carried a presumptive commit to prison for 86 months. Thanks to his own tremendous effort rehabilitating himself and Tina Appleby's resolve to show it, one count was dismissed and the other resulted in a downward departure to 180 days in the local jail as long as he is compliant with other conditions --- primarily, abstinence from alcohol and non-prescription drugs. Marsh Halberg and Lee Orwig served as trial counsel for what is believed to be the largest criminal case in Minnesota court history with over 4,400 defendants. The two HCD attorneys were members of the five-attorney trial team who collectively represented the interests of over 250 criminal defense attorneys in pursuing the source code litigation. The two-week hearing concluded at the end of December. Judge Jerome Abrams presided over the matter and issued an Order in March regarding the admissibility of source code test results in both criminal DWI and implied consent cases. That Order has been appealed on an expedited basis to the Minnesota Supreme Court. Our office together with the other three trial team attorneys has filed an appellate reply brief in October 2011 and is awaiting notice of oral arguments being scheduled before the court. As such,the breath test issue in Minnesota is still a very viable defense for us to discuss with you. Halberg Defense recently attended the Rocky Horror Picture Show theatrical performance starring Don Shelby. Mr. Shelby had some good natured teasing of lawyers but referred to us as "one of the best criminal defense law firms in the country." Thanks Don for your kind words. Our office recently defended the mayor of Jordan in a highly publicized case alleging the mayor was guilty of disorderly conduct. While we were confident in the strength of our legal defense, Marsh Halberg negotiated a very favorable result which will result in the case being dismissed in one year without a conviction.The legal mechanism for this case is called a "continuance for dismissal". Under this negotiation there is no admission of fault and there is no conviction.Our client wil never have a criminal record as long as he complies with a couple basic conditions including remaining law abiding. The disorderly conduct charge resulted from an incident that occurred this last July. The mayor had approached a person in a vehicle at a funeral home in Jordan and it was alleged he had acted improperly. This resolution allowed our client to maintain his innocence and continue in his duties as mayor. Halberg Criminal Defense is honored to announce that we have been named as one of the "Best Law Firms" in the upcoming U.S. News and World Reports Best Law Firms Edition. Halberg Defense was ranked as a "First Tier" law firm in the category of DWI Defense. The methodology for the U.S. News – Best Lawyers "Best Law Firms" involved surveying thousands of law firm clients; leading lawyers and law firm managers; partners and associates; and marketing officers and recruiting officers. Each were asked what factors they considered vital for clients hiring law firms, for lawyers choosing a firm to refer a legal matter to, and for lawyers seeking employment. Our firm is acting as one of the lead set of attorneys representing the Source Code Coalition. The Coalition represents a group of over 4400 DWI cases that have been joined together to challenge the accuracy of the software program/source code that runs the machine. Significant issues are coming to light involving improper source code that exists on at least some of the Intoxilyzers in use in Minnesota. On July 8th our office filed pleadings notifying the Court of these significant issues. Formal motion hearings will likely be scheduled soon unless informal agreements can be reached with the State to provide answers to the problems uncovered by the Coalition experts. The trial on these cases is currently set for October 2010 but that may now change based upon these new source code problems that exist. As the source code issues are changing on a daily basis please contact us for more recent updates. A St. Louis County judge ruled that the sherrif’s deputy who stopped Eric Nelson’s client did not have a reasonable and articluable suspicion to conduct a traffic stop. The officer testified that he believed Nelson’s client was attempting to evade the officer. Nelson’s client signaled a turn into a parking lot where he dropped off his friend. Nelson’s client then turned back onto the road and passed the hidden squad car moments later. The Court found that this conduct did not rise to level required to conduct a traffic stop. As a client of Tina Appleby’s drove his daughter to school, his car was struck with an object thrown by a teenage pedestrian. Her client emerged from his vehicle and restrained the seventeen year-old from leaving as he attempted to call the 911. The teenager’s friend then approached, punched Appleby’s client in the head, then boarded the school bus. As a result of restraining the juvenile for the police and subsequently trying to prevent the school bus from leaving the scene, the client was charged with two counts of Assault in the Fifth Degree (teenager and bus driver) and one count of Disorderly Conduct. Tina Appleby obtained verdicts of Not Guilty on all three counts. A St. Croix County Judge dismissed OWI charges against Eric Nelson’s client. The Court found that the officer lacked probable cause for an arrest. Specifically, the court found that the reasons cited by the New Richmond Police Officer for the traffic stop were explained by the fact that Nelson’s client had a flat tire. Further, the court found that the officer unfairly subjected the client to field sobriety tests by making her perform them barefooted in 30 degree weather. After four hours of deliberation, a Dakota County jury found Eric Nelson’s client not guilty on counts of first and second degree criminal sexual conduct. "I'm sure today or tomorrow, whoever is teaching criminal law in law school in Minnesota, will be talking about this case." A St. Louis County judge found that the arresting officer violated our client’s right to counsel and dismissed criminal DWI refusal charges and reinstated his driving privileges. Attorney and Partner Eric Nelson successfully argued that the officer violated his client’s right to speak with a lawyer prior to deciding whether to submit to chemical testing. Our client initially declined his right to speak with a lawyer, however, immediately changed his mind and told the officer that he did want to speak with a lawyer. Because the officer refused to allow our client an opportunity to speak with an attorney after he had changed his mind, the court ruled that the officer violated the right to counsel.